Fast money! It sounds like a good idea to Seth Davis, who's a college dropout running an illegal casino from his house. Selling stocks seems like the way to go. It isn't. I've just been to the cinema to see The Wolf of Wall Street, and before going I did some research on the topic of fraud with shares and the like. 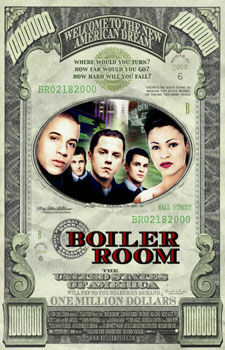 I read about boiler rooms and this movie. The cast seemed promising, but I guess there's a reason for me to not have stumbled upon this earlier. Since I've seen The Wolf of Wall Street and read about the overall subject I know that some of this actually has taken place, and that keeps to amaze me. But fact still remians that this has been put to the movie format and therefor has to stand trial among other great films. There's three major issues with this movie. The acting has seen better days. Vin Diesel, Ben Affleck and Giovanni Ribisi has all delivered way better before and after this. The music is of in the entire movie. I think there might be a "good" reason for most of the music to hiphop, but is just do not fit with a stock broker movie. I feels like the director might have done or would really like to do a lot of hiphop music videos. This is worst in the first third of the movie, but still keeps kicking in here and there. I mean Tarantino can get of by using gangster rap in Django Unchained, but that's a style and a comment. I know that a lot of hiphop evolves around fast money, but that does not make it ok to only use hiphop for an entire movie. This leads me to the diting, which is a bit half hearted. Especially a scene with the female protagonist. It's about 10-12 seconds long. And tries to set the situation of her life, so we get some background on her before she becomes important to the plot. But seriously. One scene with to shots in 12 seconds is just not enough. Then better leave it out.